With our Corporate Headquarters in Virginia Beach, VA and our Operations Division in Manassas, VA, GVI operates core offices strategically located near concentrations of maritime activity and naval homeports including Middletown, RI; North Charleston, SC; and Upper Marlboro, MD. We recognize the fact that our employees are the key to satisfied customers. As such, we make it a point to listen to our employees and create a collaborative work environment in which ideas are shared and employees are rewarded. Our employees work extremely hard as a team to provide the best possible solutions for our customers. Our management team is careful to place the appropriate individuals in the positions requested by the customer, and continuously follow-up to ensure the services exceed expectations. Establishing standard processes has been and will continue to be our highest priority. We work with our customers to define and document standard processes to ensure that the services and products we provide are consistent and of the highest quality. 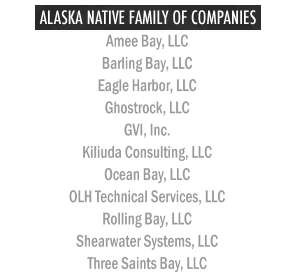 GVI, Inc. is a Systems Engineering and Logistics & Program Management Firm that is an Alaska Native Corporation (ANC)-owned, Small Disadvantaged Business (SDB), and 8(a) Program graduate. We are a subsidiary of Three Saints Bay, LLC, which is owned by Old Harbor Native Corporation. Our Corporate Headquarters is in Virginia Beach, VA; our Operations Division is in Manassas, VA; and we have offices in Middletown, RI; North Charleston, SC; Upper Marlboro, MD. Copyright 2017, GVI, Inc. All rights reserved.